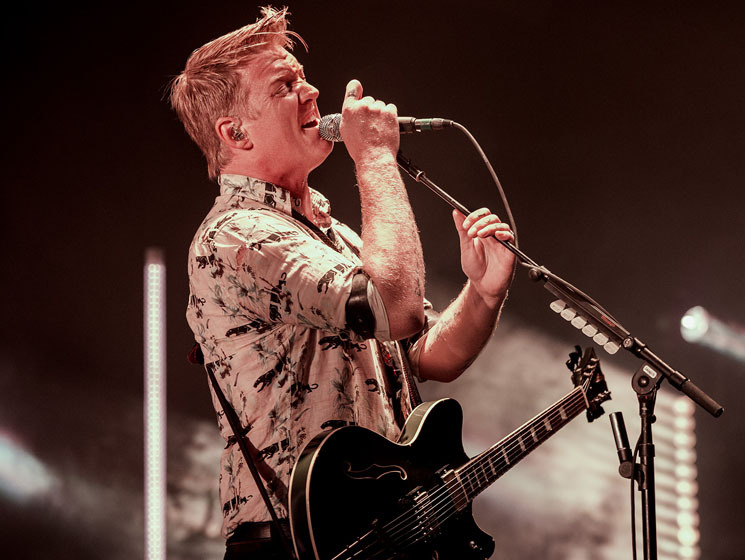 Bringing their "Villains Wold Tour" to Edmonton, Queens of the Stone Age attempted to give fans a strong start to their long weekend, but a rocky beginning to their stop at Rogers Place proved that the real villain for the evening was an unpredicted illness. For the first half of the performance, frontman Joshua Homme was clearly struggling to control his voice, as his pitch would run away from him and become almost inaudible. Homme noted early into the set that he was battling an ailment, and on a doctor's recommendation, wasn't supposed to be performing. Feeling under the weather could have been the contributing factor to the entire group's lethargic stage presence — as if they were all simply going through the motions of getting through the night. This reflected early on, as the opening song, "If I Had a Tail" seemed uncoordinated. Despite possibly feeling the effects of a long tour, Queens of the Stone Age gave a solid effort to re-obtain their known and reputable musicianship toward the tail end of their evening. With the prominent, crunchy guitar tone that has been synonymous with the group for more than two decades blaring into the audience, the band did well to reclaim their consistency through each song, and at different times, each member had a chance to showcase their individual talents. From the thumping and pounding drum solos of Jon Theodore to the wailing guitar solos of Troy Van Leeuwen, later songs were the salvation for the set as the visual aspect still appeared to be an afterthought. Despite a tough start to the evening, Queens of the Stone Age built a solid setlist that spanned their discography, catering to their fans both old and new. With the time it took time for the group to build momentum, once QOTSA started pounding out some of their better-known bangers, like "Little Sister" and "Head Like a Haunted House," their onstage chemistry started to react with one another. The listless atmosphere took a back seat as Homme kicked his performance into overdrive, gaining control over his vocals and leading the band to a strong finish. Before igniting their encore, "Go With The Flow" was the precurser that gave the room some energy before the group left the stage and quickly returned to finish with the evening with "Feel Good Hit of the Summer" and "A Song For the Dead." Ending their evening on a higher note than they started, fans will surely be eager to see what the band can do next time around with a healthy performer.